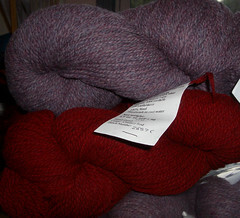 As if I didn't buy enough yarn last weekend at the Knit & Crochet show...I just got some yarn from Blackberry Ridge Woolen Mill in Wisconsin for a top-down sweater using Barbara Walker's Knitting from the Top. The yarn is minimally processed, sourced and spun in the US. The colour is gorgeous and it looks so soft!! !